Bradburn, Jamie. "Toronto Feature: Spadina Expressway". 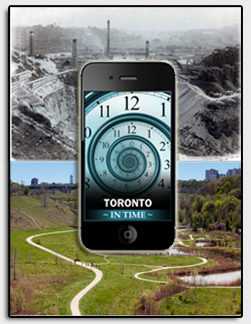 The Canadian Encyclopedia, 06 August 2015, Historica Canada. https://www.thecanadianencyclopedia.ca/en/article/toronto-feature-spadina-expressway. Accessed 26 April 2019. 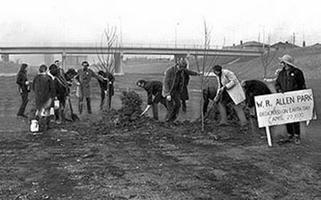 Anti-expressway protestors plant trees in the uncompleted section of the Allen Expressway south of Lawrence Avenue on Earth Day, 22 April 1970, calling it W.R. Allen Park. This did not last (public domain). 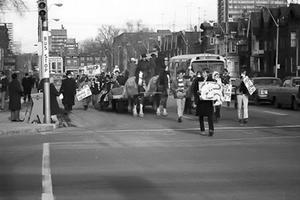 Citizens on the Stop Spadina campaign, 6 Dec 1969 (courtesy Toronto Telegram, Clara Thomas Archives and Special Collections, York University/Image 705). 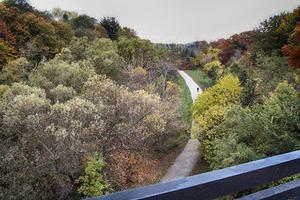 Cedervale Ravine, one of the green spaces through which the expressway would have run, in 2012 (photo James Marsh). "Stop Spadina!" served as a slogan for Toronto residents who organized during the late 1960s to fight the destruction of their neighbourhoods. Had the full route of the Spadina Expressway been built, it would have carried heavy traffic through the Cedarvale Ravine and dug a trench down Spadina Avenue to Bloor Street. There, cars would have poured off the expressway onto local streets. Citizens watched nervously as construction reached Lawrence Avenue in 1966. Raising the alarm and challenging the expressway plans, local residents enlisted some heavy hitters on their side. "Toronto will commit suicide if it plunges the Spadina Expressway into its heart," Marshall McLuhan was quoted as saying. With Jane Jacobs, McLuhan made a documentary film, The Burning Would (its title from a Joyce pun in Finnegan's Wake, "A burning would has become a dance inane") that showed all over North America. While the fierce opponents of the expressway could not convince Metropolitan Toronto council, city of Toronto council or the courts to cancel the project, their final appeal to the government of Ontario was a stunning success. On 3 June 1971, Premier William Davis withdrew provincial support. "If we are building a transportation system to serve the automobile," Davis told the legislature, "the Spadina Expressway would be a good place to start. But if we are building a transportation system to serve the people, the Spadina Expressway would be a good place to stop." Spadina's demise cooled enthusiasm for the proposed Metro Toronto expressway network, prompted citizens to take a greater role in neighbourhood planning and helped spur the reform movement that dominated city hall during the 1970s. The province eventually transferred to the city a strip of land at the south end of the built section, now known as Allen Road, to block future extension attempts.